Overall condition of the boat is very good. As noted above, she has been well maintained and is in solid mechanical condition. All upholstery looks good with little sign of wear. Forward deck paint has worn spots that need repainting. Seller is planning to paint deck soon. Bottom paint only four months old at the listing date. Stock #155717 Well kept Bayliner. Fuel efficient Hino diesels, ready to cruise! 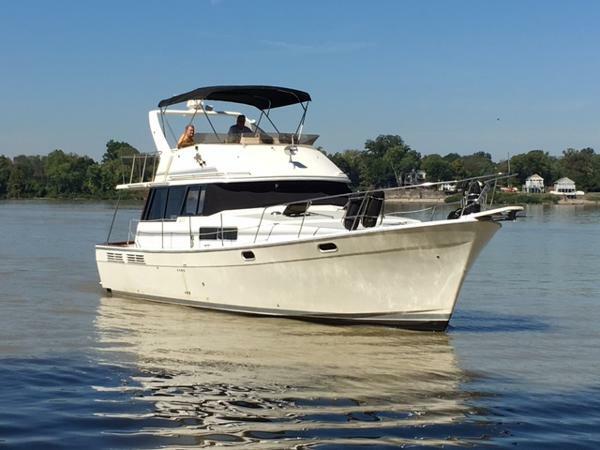 If you are in the market for a motoryacht, look no further than this 1990 Bayliner 3888 Motoryacht, just reduced to $59,500 (offers encouraged). This vessel is located in Thunderbolt, Georgia and is in great condition. She is also equipped with twin Hino engines. 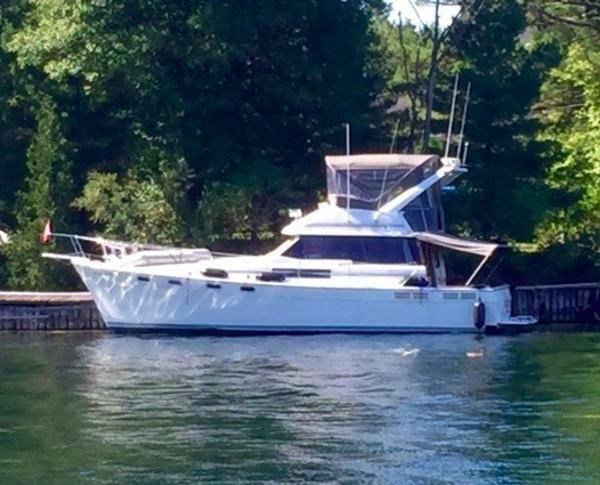 Reason for selling is smaller boat. 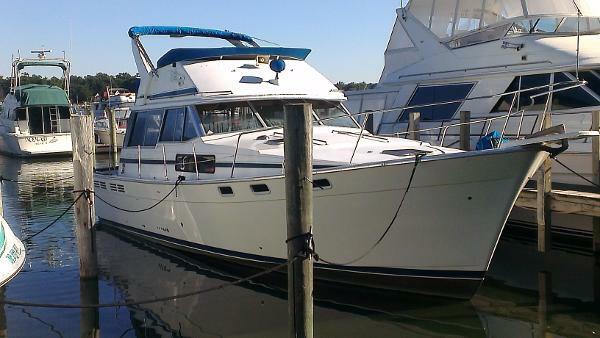 1994 Bayliner 3888 Motoryacht Very clean and well cared for 1994 Bayliner 3888. Approx. 2240 hours and 2310 hours on twin Hino 210 horse power diesel engines. 2 - 3010C GARMINs 10.4 inch screens in perfect condition. FURUNO radar system in perfect condition. 8K GenSet with 500+hours. Lawrence fish finder in Aft Deck area for fishing. Down rigging plates (3), 350+ feet of anchor chain and rope. Trolling governors (2). Two staterooms with queen beds. Two head - one with shower and tub. Two new VHF marine radios. Canvas inclosed flybridge and aft cabin. Forced air heating throughout keeps you toasty warm. All ground tackle included. 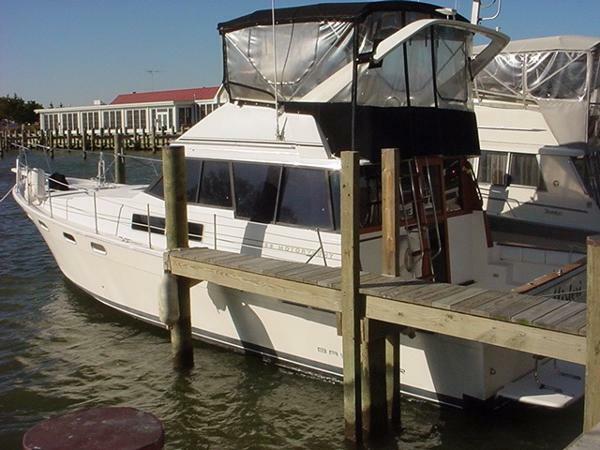 $89,500.00 - this boat is in excellent condition. Hull / deck and Mechanical (plus engine oil sample test) Survies from 2016 availible for your veview. 1993 Bayliner 3888 Motoryacht Reliable and Economical 4 cylinder Hino Diesels 210hp, Westerbeke 8kW generator, Dual A/C and Heat with Digital controls, Upper and Lower Helm, Garmin GPS, VHF, Compass, Fighting Lady Yellow Hull, Top & Full Enclosure on Bridge with Aft Bimini on Cockpit, Only 1200hrs. We will bet you will not find a nicer 38 Bayliner. 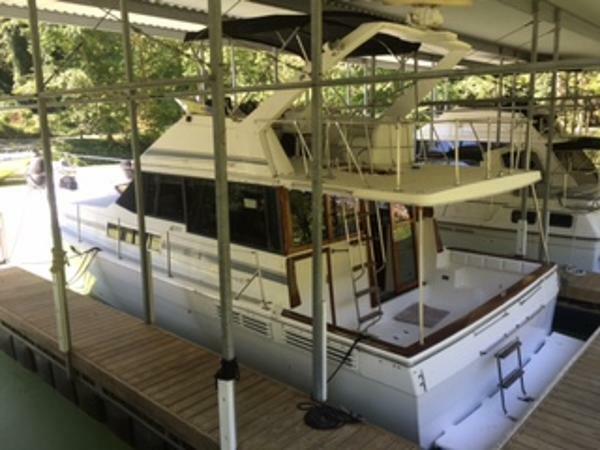 1990 Bayliner 3888 Motoryacht VESSEL HAS ALWAYS BEEN IN FRESH WATER, NEW CANVAS WITH SCREENS, AC/HEAT, GENERATOR, ALL SERVICE RECORDS UP TO DATE AND AVAILABLE, NEW UPHOLSTERY ON SETTEE, NEW CURTAINS. Equipped with Twin Hino Diesels at 175hp each. 1990 Bayliner 3888 Motoryacht The 3888 Motoryacht is one of Bayliner's most popular Models. They offer maximum space utilization, dependable very comfortable long range cruising accommodations, a nice turn of speed with the efficient diesel power package, pleasing traditional lines and terrific affordability. This boat is a very nice example of that well thought out cruiser. 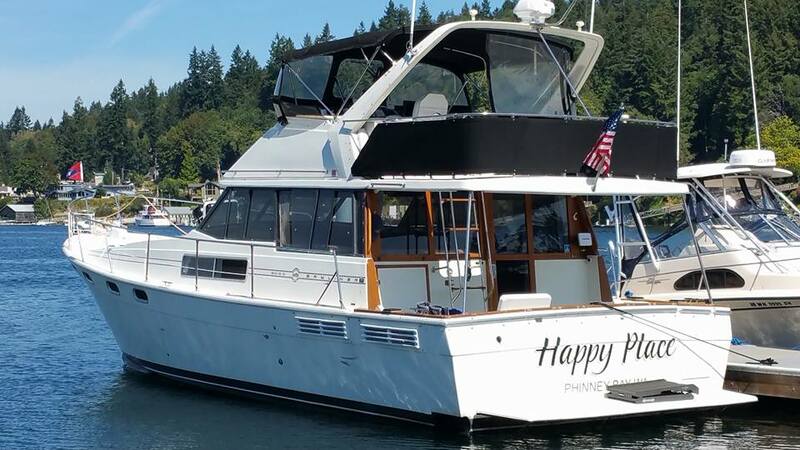 She features all the popular options plus a BOW THRUSTER and shows very well. The owner is motivated and the aggressive asking price reflects that. Currently moored in fresh water and under cover. This is going to make someone an excellent buy. 1990 Bayliner 3888 Motoryacht The 3888 Motoryacht is one of Bayliner's most popular Models. They offer maximum space utilization, dependable, very comfortable long range cruising accommodations, a nice turn of speed with the efficient diesel power package, pleasing traditional lines and terrific affordability. This boat is a very nice example of that well thought out cruiser. She features all the popular options and shows very well. The owner is motivated and the aggressive asking price reflects that. Currently laying in fresh water under cover. This is going to make someone an excellent buy. 1993 Bayliner 3888 Motoryacht Super Popular coastal & long range cruiser with excellent fuel economy, functional lower helm & classic profile. Make an appointment to come an check her out today! 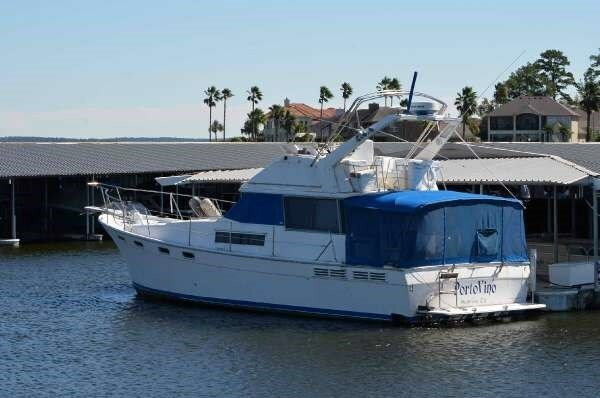 1992 Bayliner 3888 Motoryacht Sedan BAYLINER 3888 MY POWERED BY A PAIR OF HINO 220 HP TURBO CHARGED DIESELS. BE CERTAIN TO REVIEW THE EXTENSIVE LIST OF HER MORE RECENT SERVICE, UPDATES AND MAINTENANCE SHE HAS RECEIVED OVER THE LAST SEVERAL YEARS UNDER "FULL SPECS". INCLUDES A 10 FOOT TWIN VEE DINGHY WITH A YAMAHA 20 HP FOUR STROKE MOTOR. TWO BRAND NEW FLEXSTEEL HELM CHAIRS. REBUILT STARBOARD ENGINE, REPLACED BOTH FUEL TANKS, RECENT SURVEY AND OIL SAMPLES. CHANGE OF PLANS FORCE OWNERS TO SELL. 1990 Bayliner 3888 Motoryacht The Bayliner 3888 Motor Yacht is a great cruiser with a unique floor plan that really makes this boat special. The salon has a lower helm, and a large dinette table with seating for plenty while a double berth extends underneath the salon sole for added sleeping accommodation. The stateroom is surprisingly large, with access to its own personal head as well as the tub/shower stall that is also connected to the double berth. 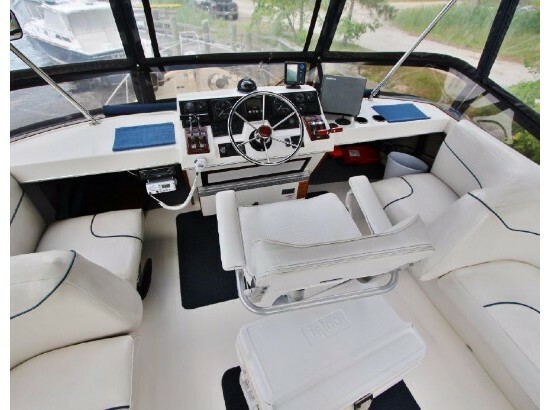 The cockpit has room for a few deck chairs and the flybridge has seating for several to relax while underway. 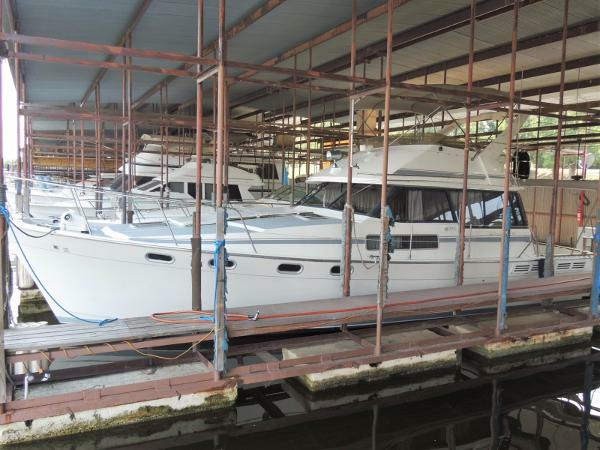 The owner has down a good job maintaining this Bayliner, so come take a look for yourself. 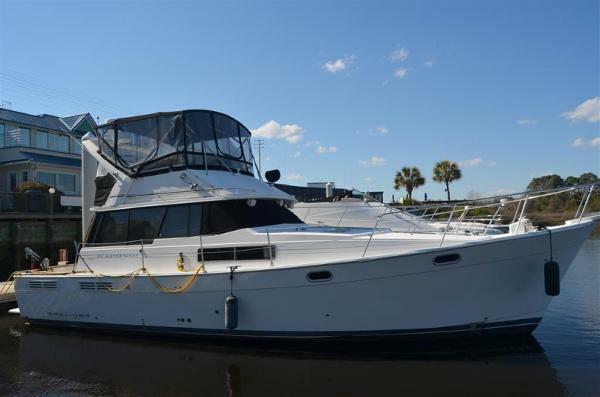 1988 Bayliner 3888 Motoryacht The 3818/3870/3888, boasts an impressive two cabin, two head layout. Additional features include a full galley, dinette, and lower helm plus the ability to get to the engines from an exterior door access. Her mile per gallon efficiency makes her popular for those seeking to do extended cruising. 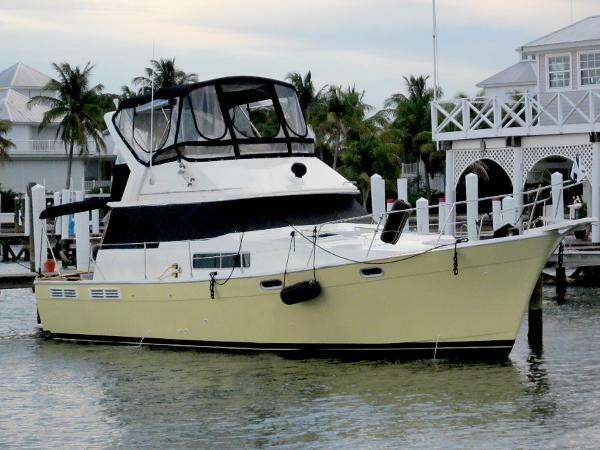 1998 Bayliner 3888 Motoryacht The Bayliner 3888 is a true motor yacht. This vessel has great qualities, and design. Hand built by master craftsman with attention to detail. This 3888 is designed for a venue of boating on any water. From hanging out on the docks, yachting the coast, or just cruising on your saint somewhere lake or bay. The 3888 including twin powered diesels with power to spare. This yacht offers so many designed value features, and options. Generator... AC or Heat...while under way this will keep your stateroom, galley, salon, and excellent accommodations, nice and cozy. Deliver International appeal and style...with great price. 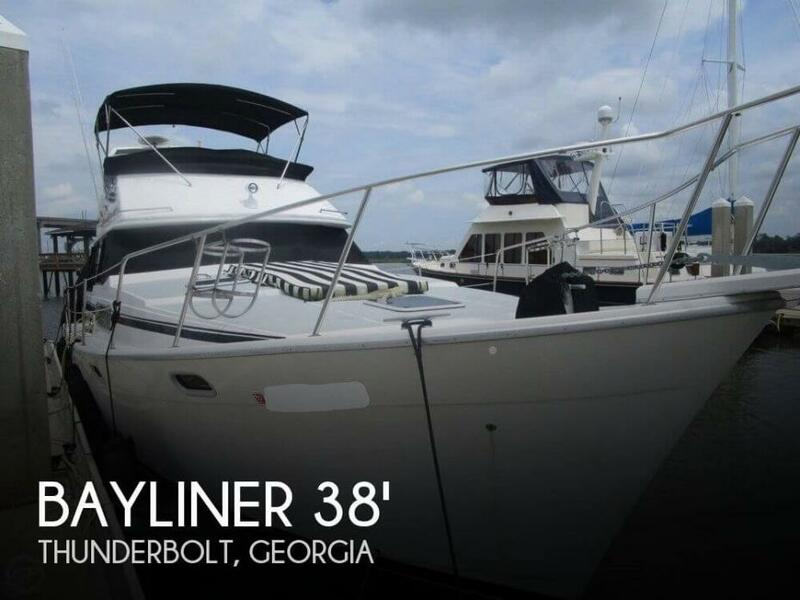 For more information on this great yacht call us - This flybridge...Bayliner 3888 Yacht...inspire serious notice!Disclaimer The Company offers the details of this vessel in good faith but cannot guarantee or warrant the accuracy of this information nor warrant the condition of the vessel. A buyer should instruct his agents, or his surveyors, to investigate such details as the buyer desires validated. This vessel is offered subject to prior sale, price change, or withdrawal without notice. *NOTE: Inventory will be shown on an appointment basis only. These boats are stored in secure and covered slips or storage units and are not available for "hull kicking" until an appointment is confirmed.Price, if shown, does not include government fees, taxes, dealer freight/preparation, dealer document preparation charges or any finance charges (if applicable). Final actual sales price will vary depending on options or accessories selected. NOTE: Models with a price of "Request a Quote" are always included in a $0 search, regardless of actual value.